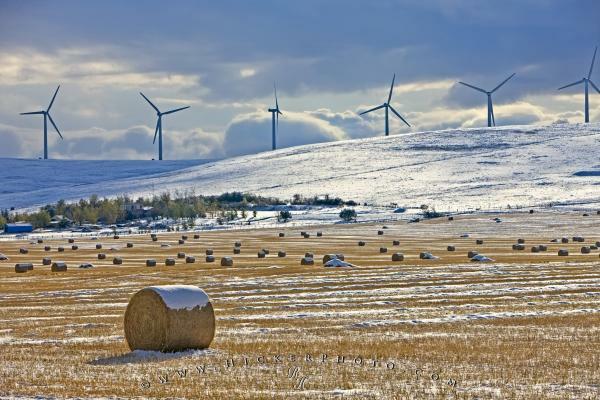 Early winter has settled in southern Alberta, Canada where hay bales are covered in snow and windmills produce alternative energy. A row of windmills dominate the hills behind a farm in Southern Alberta, Canada during the winter. These windmills produce energy by alternative methods other than traditional hydro dams, or nuclear plants which are not as environmentally friendly. Hay bales covered in snow in Cowley backdropped by windmills in Southern Alberta, Canada. Photo of a row of windmills in Alberta, during winter, an alternative means of producing energy. Pictures from photo gallery "Alberta Pictures"
This picture is part of the photo album "Alberta Pictures" - there are more beautiful images waiting for you.